Using four 180-degree lenses TwoEyes VR 360-degree 4K VR camera mirrors human eye sight for more realistic VR viewing experience. Like the feature? Let’s keep checking. 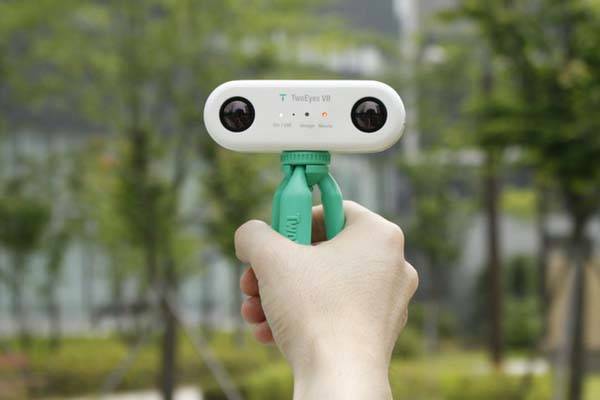 TwoEyes VR is an innovative and advanced binocular 360-degree VR camera that measures 98 x 35 x 40mm and weighs 200g. As shown in the images, the 360-degree camera boasts a minimal and ultra compact form factor that allows you to take it anywhere you go, and smooth exterior and matte finish deliver a comfortable and firm grip during any video recording session. Moreover, its tripod hole allows you to attach the mini camera to a tripod for more sturdy recording. Unlike regular 360-degree camera, the TwoEyes features two pairs of 180-degree fisheye lenses with f/2.0 aperture that are placed 65mm apart in order that you can use it to capture 360 degrees around just like your eyes would view the world. Using the unique feature, the VR camera is able to record more realistic and stereoscopic 3D or VR videos. 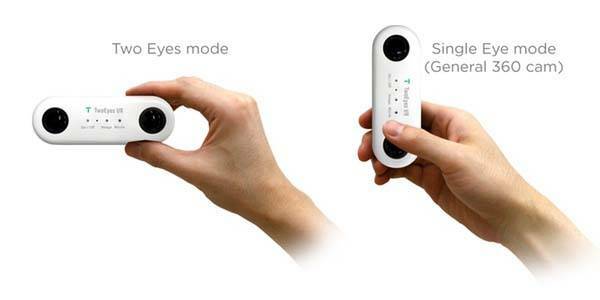 Furthermore, the VR camera comes with two modes: One-eye Mode and Two-eyes Mode. 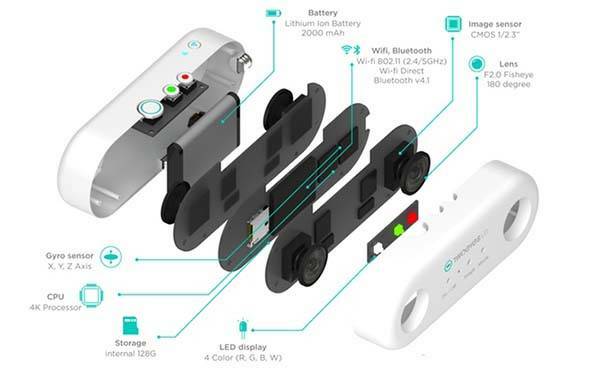 Using built-in gyro sensor, the mini camera detect how you’re holding your TwoEyes VR and automatically switch between the two modes, and in Two-eyes Mode, you can record realistic 3D video. Moreover, the VR camera also features a 4K processor and 1GB RAM so it supports 4K video recording at 30fps and 8000 x 8000 resolution stills. Built-in Bluetooth 4.1 and WiFi allow it to wirelessly connect with your smartphone or tablet for remote control and easy video sharing. In addition, other features also include 128GB internal storage and 2000mAh rechargeable battery. The crowdfunding campaign for TwoEyes is ongoing via Kickstarter. Pledging $199 will let you own the binocular 4K VR camera. It will be shipped in August this year. BTW, don’t miss the wearable VR camera and more cool related gadgets by following tags.